This looks beautiful on your walls. 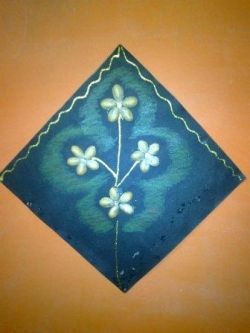 Wall hanging was the first thing I made out of pistachio shells. The one next to you is good looking as well as easy to make. It might take only 15min to make it when you have all the materials. 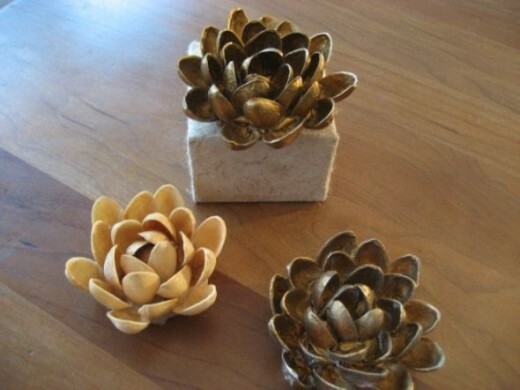 Paint the pistachio shells as per your choice of the flower color and let it dry and by that plan the design on your paper or thick cardboard. You can make a vase or a pot and paint or just keep it plain to make the one on the right. Start sticking the shells in the order of petals around a small circle or dot. You can make flowers of five petals to make it look pretty and you can add more shells to make flowers with more petals. You can give outline for your cardboard and use wax crayons to color the surrounding part of the flowers. Stick a small string behind the cardboard and your wall hanging is ready to go on your wall. 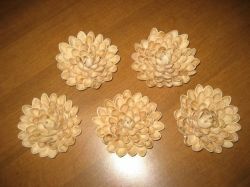 Pistachio shell flowers are very attractive and can be placed on tables and on your desk. All you need is pistachio shells, paints and glue. Paint all the shells with your favorite color preferably metallic or you can also paint once the flower is done. Stick two shells facing each other and let them dry a little bit. Then stick your third shell onto a side of the two shells and the fourth one opposite to it. Let this dry and continue sticking the shells the same way filling the gaps giving time for each one to dry for a few minutes. 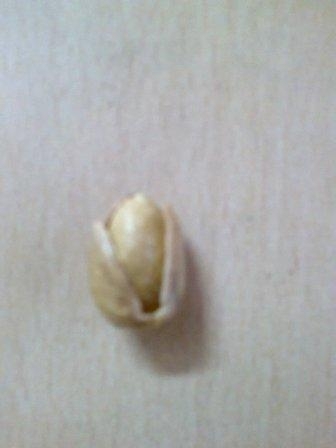 you can continue sticking the shells as shown in the pictures below till you get a sufficiently big flower. If you paint the shells with metallic colors, you can also place them in a dish containing water. This can be placed in the places where the light falls and it looks very classy and beautiful. This kind of a bowl is unique and simple to make though looks a little complicated. Pistachio shells about 150-200 to make a medium sized bowl. 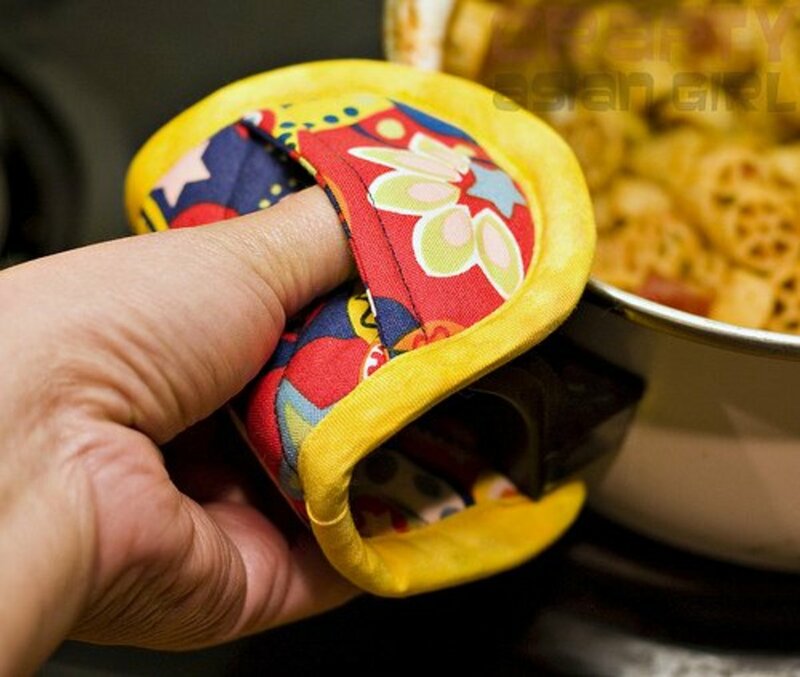 Non toxic glue(since you can store food in that bowl). 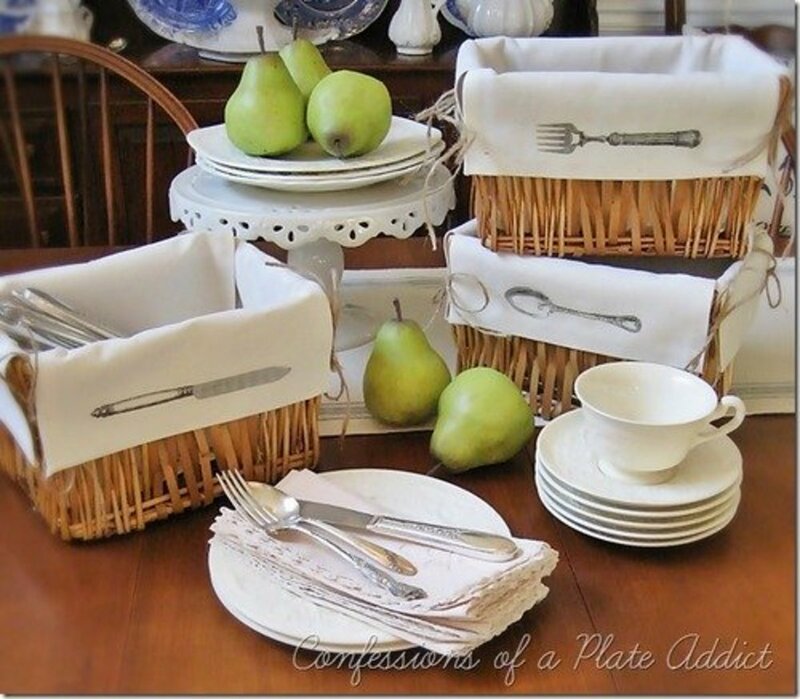 Parchment paper or plastic wrap. A bowl which is to be used as a mold. 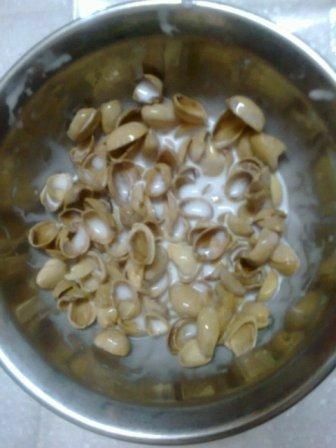 Mix all the shells with non toxic glue in a bowl. wrap the bowl used for molding with plastic wrap, turn it over and dab the shells onto the bowl and spread it evenly with even thickness.The more thick the bowl is, stronger it will be. Let it dry completely and carefully remove the plastic wrap and fill the gaps with glue to make it even and let it dry completely overnight. Your bowl is ready to use. 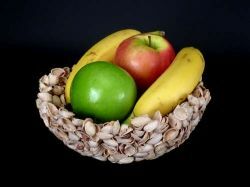 Even food can be stored in this bowl since you use non toxic glue for the making of the bowl. You can also paint the outer side of the bowl. This one looks perfect on any wall, requires less time to make and gives your wall a different look. You can also gift it to your loved ones. 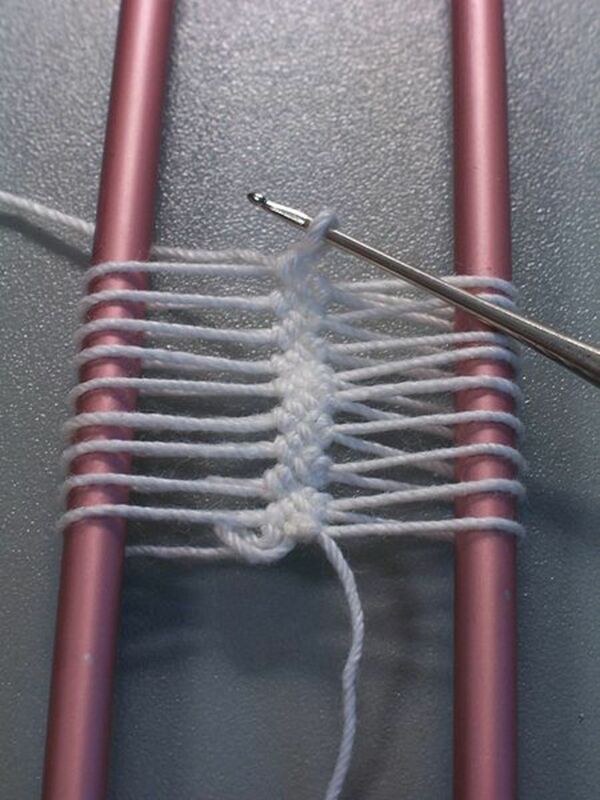 It is the same technique as that of the bowl but here you can use any strong glue of your choice. 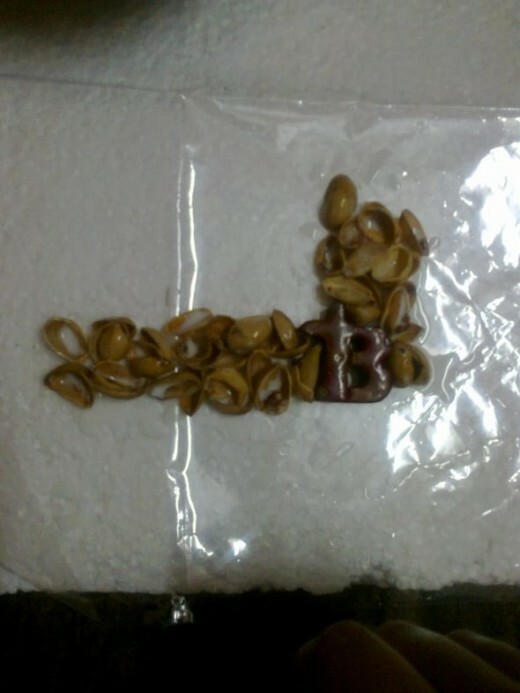 Now carefully spread the mixture evenly with even thickness on the plastic sheet in you desired shape and size. You can make a heart shaped or just a rectangle or a circular frame, leaving place in middle for your photograph. Tip: The mixture should be thick enough so that it does not spread too much and change its shape. don't move the plastic sheet and leave it to dry overnight. After your frame is dried completely, remove it from the paper. It will be strong enough to stand on a table. You can paint it if you want. I suggest to leave it like that to give it a natural look. dab a little more glue along the three sides of the frame except above. The cardboard should be little less than the size of the frame. stick the cardboard and let it dry. You can stick a rectangular or triangular piece of cardboard to make its stand. You photo frame is now ready to be put on the table with you favorite photographs in it. What do you think about this art? - And don't forget to scroll down after you put down your comments:) coz there is more! 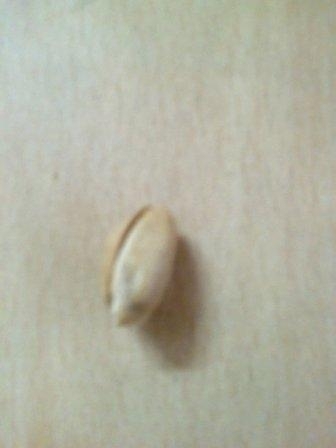 Pretty thing from pistachio shells! Clever! i love the idea of using pistachio shells! Terrific! If you're creative enough you can make art out of anything. My son kept some and wanted to do a craft with them. Maybe now we will! 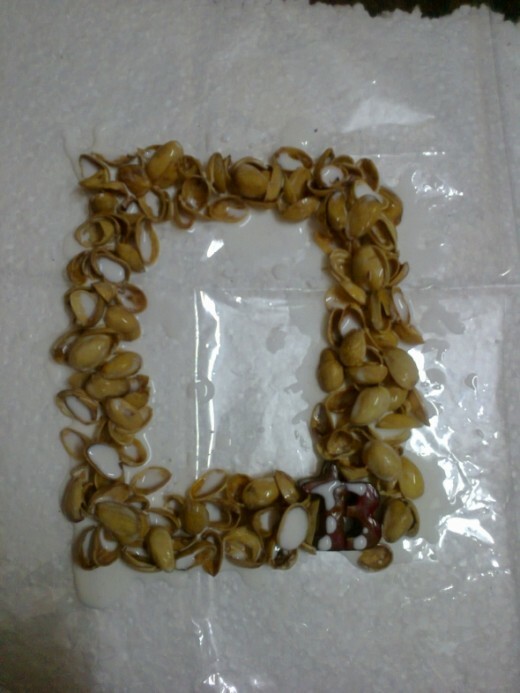 Wow, I'd never seen this done with pistachio shells before. Amazing! It's so cool! I never would have thought of it either! 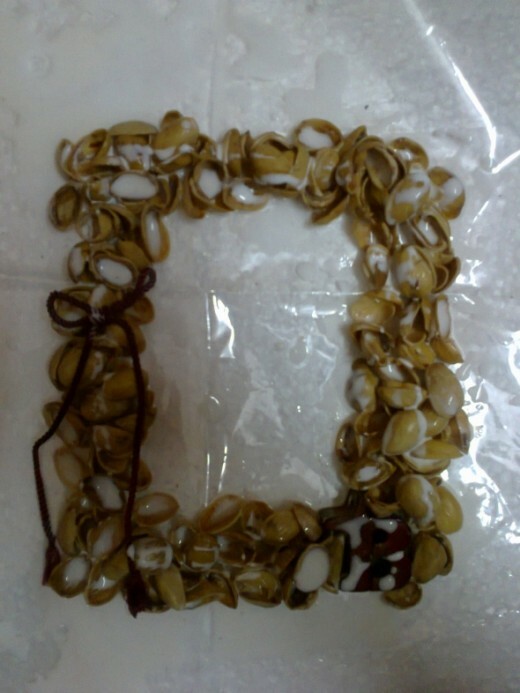 Pistachio shell art, wow who would have thought. Really cool!